Strep throat is a painful condition that is highly contagious. In some cases medication will help, while in others it will clear up on its own. When dealing with strep throat you may be looking for remedies to ease the pain, and sea salt can help. However, if you develop a sudden or severe sore throat or have had symptoms for days, it is always best to consult a physician, as there are many other conditions that cause a sore throat. Strep throat is a common condition that is caused by the Group A Streptococcus bacteria. It can occur at any age but is more common in children and teens. Exposure to the bacteria can cause mild to severe symptoms, which include a sudden fever that is higher on the second day, sore throat, headache, nausea, chills, loss of appetite, abnormal taste and difficulty swallowing. Since the symptoms are general only a physician can make an accurate diagnosis, says MedlinePlus. If severe enough, antibiotics can be prescribed to stop the bacterial infection from spreading to other areas of the body. Aside from taking antibiotics, treatment is aimed at relieving symptoms as much as possible. This includes getting plenty of rest, staying hydrated, using a humidifier and eating soft foods or foods that are cold. Gargling with salt water can also help to calm symptoms, notes MayoClinic.com. When you have strep throat you will have some swelling, which is your body's reaction to the infection. Salt can draw excess water and fluid out to reduce the swelling and temporarily relieve your sore throat. You can make a mixture of 1/4 to 1/2 tsp. of salt in 8 oz. of warm water and gargle with it several times a day. Since consuming too much salt is not healthy, it is best to spit out the mixture after gargling. All types of salt, including sea salt, have two main ingredients: sodium and chloride. It is the sodium that draws out the water and can help your sore throat. 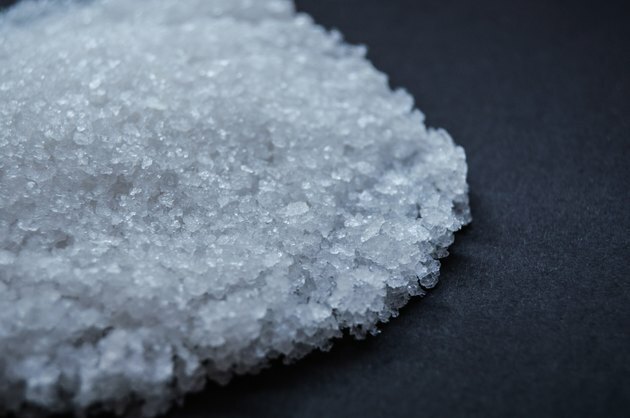 Sea salt granules tend to be larger, more coarse and have a stronger taste. Sea salt contains about 400 to 590 mg of sodium per 1/4 tsp., but some varieties may be slightly lower depending on how they are processed. In comparison, table salt has approximately 590 mg of sodium per 1/4 tsp. Given this, using sea salt may not relieve your sore throat any better than table salt. Your best bet is to take steps to prevent getting strep throat, which tends to be more common in late fall, winter and early spring. After recovering from strep throat make sure to discard any toothbrushes you were using, because bacteria can live in the toothbrush and reinfect you, according to the University of Maryland Medical Center. Washing your hands on a regular basis and avoiding touching your face when out in public or around someone who is infected will also help. Try to stay away from anyone who is infected until they have been on antibiotics for between 24 to 48 hours.